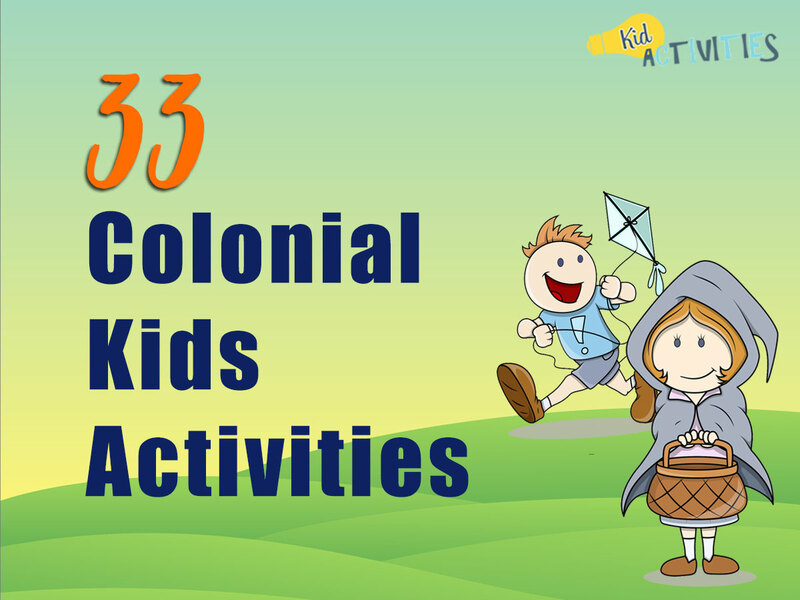 This article shares dozens of exciting Colonial Kids Activities! They are fun activities that help children learn more about colonial history in the United States. Kids love to learn about our colonial past. 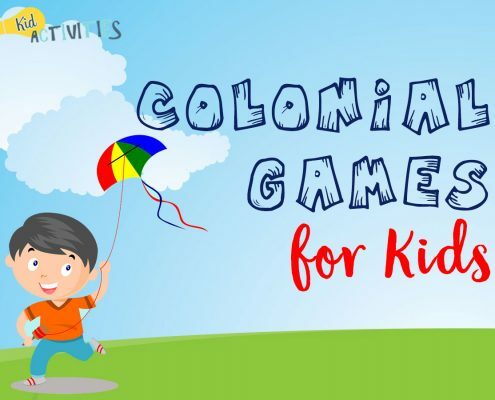 The best way to teach them more about colonial history is through colonial kids activities, because they are so fun and engaging. These activities are perfect for November, Thanksgiving, President’s Day, and any other patriotic holidays. To help you plan your colonial themed day, we’ve gathered together 33 different colonial activities including colonial crafts, colonial food recipes, colonial outfit ideas and children’s colonial games. Your children will have fun while learning what colonial kids did to keep themselves occupied. 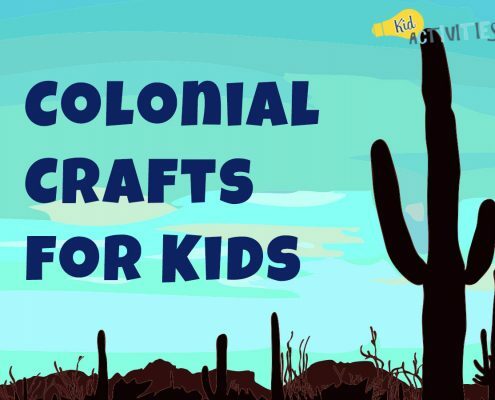 This first page of this category has colonial themed ideas and activities. Games, Food, Crafts, Literacy, Discussion, and more! Brief history and information on colonial daily life, school, food, and clothing. Be sure to check out page 2 – the gathered data is not only informative but will help you in making the most of a Colonial Theme! In early times cities were commonly known as provinces and after 1776 they became known to as states. 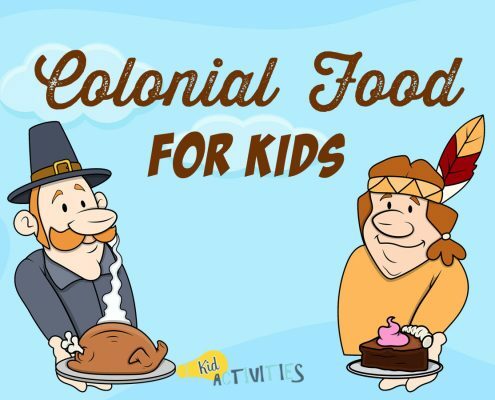 Here are a few delicious colonial food ideas that the kids will love! During colonial times, Johnny cakes were likely to appear at any meal. Many think that the original name was “Journey Cakes”, because they were so often taken along on a journey, since they could be stuffed into a traveler’s pockets. Try them hot or cold, with butter and syrup. Mix the cornmeal and salt. Add the boiling water, stirring until smooth. Add the milk. Stir well. Grease a heavy, 12-inch frying pan. Set over medium-low heat. Drop teaspoons of the batter onto the pan. Cook until golden, about five minutes. Turn the cakes carefully with a metal spatula. Cook the other side five minutes. Most of the food required by a farm family was produced on their own farm in season and had to be preserved for future use. Summer and fall were the busiest times for food preservation: the abundance of these seasons supplied the long winter and spring. The wife use methods derived from tradition, experience, periodicals, and recipe books. Using the apple corer, core the apples. Peel the apples and cut them into slices with the hole in the middle. Pass a length of string through the apple rings. Hang the apples up to dry. This will take about three weeks. When they are dry, try storing them in paper bags until spring and use them in a recipe. Before using them, soak the dried apples in warm water until they are soft and use them as you would fresh apples in pies or sauce. 1. Put 2 tablespoons whipping cream in each baby food jar. Put lid on tightly and shake as long as can. 2. Remove lid and pour off excess liquid. 3. Spoon butter into the smaller bowl and set this bowl in the bowl of ice. 4. As butter chills, continue to press it again the side of the bowl to get rid of any remaining liquid. 5. When ready…enjoy on some good bread or rolls! Tip: To speed up the process you can add a marble to the jar when shaking it! The Wampanoag Indians called the cranberry “sasemin” and made a juice from it which they sweetened with maple syrup or honey. Toss together apple slices, cranberries, and honey. Make topping in a separate bowl. Mix butter, rolled oats, flour and sugar until crumbly. Stir in nuts and vanilla. Place the apple/cranberry mixture in a 11 3/4″ x 7 1/2 inch dish. Put on topping. Bake at 350 about 50 minutes or until fruit is tender. If mixture gets too dry pour a little hot water over it. Native American and Colonial America also used cranberries as a curative for cuts and arrow wounds. The mashed fruit was placed on open wounds to draw out the poison that we call bacteria. Additionally cranberries were also used as a dye for blankets and rugs. The berry grows as far South as parts of Northern Carolina and West Virginia and was regarded by the Delaware tribe in New Jersey as a symbol of peace. Ingredients: 4lbs. apples, 1/4 cup water, 1/4 cup apple cider vinegar, 1/2 cup brown sugar, 1 teaspoon cinnamon, 1/2 teaspoon cloves (ground)Core and quarter unpeeled apples; chop or put in blender with water and vinegar. Cream butter and sugar together until light. Beat in eggs. Stir together flour, salt, soda cinnamon, ginger, and nutmeg. Mix pumpkin and buttermilk; add to creamed mixture alternately with dry ingredients, mixing well after each addition. Spoon into greased and floured 6 1/2 cup ring mold. Cover tightly with foil. Bake 350 for one hour. Let stand 10 minutes. Unmold. Serve with whipped cream. Serves 12 to 16. In saucepan combine beans, pork, water, salt, sugar and pepper. Cover; simmer until beans are almost tender. Stir in corn. Cover and simmer until vegetables are tender. Remove salt pork. Blend cream slowly into flour. Stir into vegetables. Cook and stir until thickened and bubbly. Serves 6. Have the kids write their names using a QUILL PEN and parchment paper. 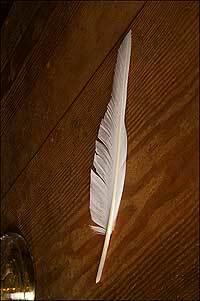 Cut 1/4 inch off the back of the quill. Next cut approximately 1/2 inch off the front, forming a point. Adjust as necessary to get a suitable writing point. Pour some washable ink into a container and test out the new pens. Most will find writing with the new pen a challenge! Just like Noah Webster did! Noah Webster wrote in his diary almost every day during his entire life. The following are excerpts from his diary. 1784, August 10. Had fun reading books and playing the flute. had dinner at Mr. Pratt’s. We ate Sea-Turtle. 1784, October 25. Came up with the idea to have a dance tomorrow. 1784, October 26. Many people attended the dance. It was very fun! 1784, October 27. Very tired from the dance. 1784, December 1. Walked to West Division to celebrate Thanksgiving. Colonial children, like children today, also told nursery rhymes and Tongue Twisters. Click here for KidActivities Super Tongue Twisters and Tongue Twister Games! Note: there is some great information on page 2 about family life and children’s chores in colonial America. Some of the things kids did back then may be just like chores that kids do today. Unlike today, many of the kids in Colonial times did not get paid or get an allowance for doing chores, but had to work like everyone else in the house to “earn their keep.” In other words, they worked in order to eat, have a nice place to sleep, and help their families. Some youth might also start to learn the family business at a very young age. Example: blacksmith, tinsmith, miller, or working with a doctor or a store clerk. If family knew someone in town who could teach some of these things, children may be sent to live with them and learn the activity as their apprentice. Colonial life was filled with work, but it wasn’t always hard or boring. Early Americans knew how to turn work into fun by singing or telling stories, having contests, or working together in spinning or quilting bees. Some liked to dance to fiddle and fife music. They enjoyed the time they spent playing games. Colonial often played outdoor games that didn’t require toys. Many of our games today have changed very little over the centuries, and these activities give a sense of how old some of today’s pastimes are. They are released from this ‘Frozen T’ position when another child runs under their arms. 1) One foot in each square only. The game the colonists called jackstones is known today as jacks. You can buy a set, which includes six 6-pointed metal jacks. Or you can be like colonial children and use six small stones, pumpkin seeds or any other small objects that are all the same size. A set will include a small, bouncy ball, but any small ball with a good bounce will do. Or, like colonial children, use a round, smooth stone. If you use a stone, toss it the air rather than try to bounce it. There are more than 100 different jacks games, but most follow these basic rules. 1. Two or more people can play, indoors or out. 2. To start: a player tosses the ball in the air, scatters the jacks, and catches the ball on one bounce. The player wants the jacks to land pretty close together, but not so close that they’re hard to pick up one at a time. Even if the player doesn’t like the way they landed, they must play the jacks as they lie. 3. During play, the player must pick up the jacks and catch the ball on one bounce with the same hand. 4. When picking up jacks, the player can touch only the ones they are picking up. If player moves or touches others, their turn is over. 5. On any play, each player has only one try. If they makes a mistake, it’s the next player’s turn. 6. If a player makes a mistake and loses their turn, on the next turn they go back to the beginning of theplay in which they made the mistake. one bounce with the same hand. Player 1 then puts the jack in the other hand and repeatsthe play, again picking up one jack. Player 1 continues until all six jacks have been picked up,one at a time. Player 1 bounces the ball, picks up two jacks, catches the ball on one bounce in the same hand, then puts the jacks in the other hand. Player 1 continues until he/she has picked up all six jacks, two at a time. Player 1 bounces the ball, picks up three jacks, catches the ball on one bounce in the same hand. He/she then puts the jacks in the other hand and repeats the play to pick up the remaining three jacks. Player 1 picks up four jacks on one toss, then two on the next toss. •For fives (fivesies): Player 1 picks up five jacks at once, then one jack on the next toss. A player who goes from ones through sixes without an error is a winner, but this player canbe tied if another player also has a perfect round. Remember, when a player loses a turn, he/she starts the next turn at the beginning of the mistake. If the error was made on threes, for example, the player starts over at the beginning of threesies. To see a few other variations of Jacks-visit Games for Small Groups. Jacks is #40 page bottom. 1. If you are playing in a group with more than three players, you start by lining up in single file. 2. The first person in the line takes a few steps forwards and then bends over to make the first frog. 3. The next person in the line then leaps the first frog, carries on for a few steps and then bends over to make the second frog. 4. The third person in the line then has to run and leap frogs one and two and then bends over to make the third frog. 5. This carries on until all the players have jumped. This can be played with one line or in Teams. If you are playing with 2 or three children to a line–introduce a MATH component to the ‘Leap Frog’ and MEASURE HOW FAR each child jumps! First you pick someone to be ‘It’ (the person who seeks). When that number is reached, “It” says “Ready or Not, Here I Come” and rushes to find everyone. Players try to get to base without being tagged or else they are the new “It”. If the person who is “It” doesn’t get someone in three tries he gets to pick a child to be it! Most colonial CARD GAMES were made for adults and were not considered games for kids. If the children played with cards it was as many kids do today, stacking them into a “house” of cards. Get out a deck or cards (or several) and use them to build a tower. Lean one card against another, creating a triangle with the table top or floor. Create a second triangle a couple inches to the left or right of your first one, and connect the two with a card laying flat over top. See how tall you can make your tower. This can be done as an individual, a team, or as a competition. Can you believe that jigsaw puzzles have been around since the 1760’s? A man named John Spilsbury, an engraver and mapmaker in London, attached maps of England to thin pieces of mahogany wood and then carefully cut around the shapes of the counties. Around the same time in France, a man working for the King made a similar game and thus the puzzle was born. These map puzzles or “dissected maps” were soon put to use with American Colonial children to teach them the way each county looked and what counties were next to each other. It was not until 1840 that puzzles began to have “snap-in” or interlocking pieces like most of our puzzles do today. Map puzzles were the most popular puzzle, but by 1787 puzzles with pictures of different kings were also made. What would Mr. Spilsbury think of all the different types of puzzles we have today? A Pomador Ball was a large apple with cloves in it to give it a nice smell. 1. Use a fork to make many little holes in the skin of an apple. 2. Insert a clove into each of the holes. Do this until the entire apple is covered with the cloves. 3. Put the apple into a bowl and pour some cinnamon on it. Set the ball in a cool place for a few days. 4. To hang the ball cut the ends off the net and leave it so it is about 10 inches long. 5. Slip the ball into the net. Tie a bow with the yarn at the top and the bottom of the net. 6. Cut an 18-inch piece of yarn. Tie a knot forming a 6-inch loop. 7. At the top of the pomander ball tie –the remaining string from the loop into a knot and then hang. Mix cornmeal, salt and paint with enough water to make a play dough texture. When colonial families faced a hard task, they made the work lighter and more enjoyable by working together. One family would host the ‘bee’ and everyone would work together and tell stories or sing songs. In the evening, after the work was done, the host family would serve a big meal and the children would play. For colonial women, quilting was not just the creation of a needed household item. Quilts were a thrifty use of material leftovers, a form of decoration and an expression of pride. In Colonial day, when every piece of cloth was brought from Europe at an opulent cost, each scrap left from the cutting of clothing was worth as much as its equivalent to the garment itself. Thus the “Crazy Patch,” quilt was invented. Each piece of cloth was fit together so that not a strand of the valuable material was wasted. It mainly consisted of silks, ribbons, wool, and velvets. It not only was the humblest of all bed-coverings, but it served the purpose of keeping the family warm on those cold winter nights. Ladies exchanged intricately designed patterns, each with its own name such as Crow’s Foot, Chinese Puzzle, Love-Knot, and Sunflower. Groups of women would gather together for several days in quilting bees, working together to make one beautiful quilt. Your squares should represent yourself. Draw your favorite food… write your name in calligraphy…draw a picture of a colonial craft item or someone using the craft item. CHILDREN OF COLONIAL TIMES ALSO USED ‘NATURAL MATERIALS’ FOR FUN! Choose the largest, firmest apples you can find. The apples shrink a lot when they dry so you want to be sure that they are big enough to begin with. Firm apples will be easier to carve and will dry out much better. • The first step in making your shrunken apple heads is to peel the apples. You can core them if you would like, although it is not necessary. Next, brush a mixture of lemon juice and salt onto the peeled apple. The lemon juice and salt mixture will help to keeping the apples from turning as brown as usually when they dry. • Next, you will want to take a paring knife and carve out the basic features of a face from one side of the apple. Don’t go into too much detail since when the apple dries any small details will be lost. Focus on creating large features like the eye sockets, a nose and a mouth. Example: To make a shrunken apple for a witch’s head you would most likely carve a large nose, two deep holes for the eye sockets and a sneering hole for the mouth. Keep the shapes that you carve simple and larger than you think you need them to be since they will shrink as they dry. • Place the carved apples somewhere dry and out of the way. Turn them every couple of days in within about 2 weeks they will have shriveled up into ghoulish little faces. You can speed up the drying time if you would like by setting them on a cookie sheet in the oven on the lowest setting or by using a food dehydrator, although it will still take some time for them to dry and shrivel. • You can make a body by putting the heads on small bottles (shampoo, dish soap etc.) Make a dress out of a piece of fabric. You can even use a small paper clip to make glasses. Silhouettes are a type of shadow picture. They have been made for centuries and became very popular during the life time of George Washington. Before cameras which make photographs were invented, the only way you could have a picture of a person was to have a painting or sketch made of that person. If you weren’t able to paint a portrait yourself or unable to pay for an expensive portrait to be made, you could have a cheaper version made for you, namely a silhouette. A silhouette traced the outline of a person’s profile. Though it didn’t show you the color of a person’s hair or eyes, it did give you a reminder of how the shape of the person’s face appeared.Since silhouettes required little skill as the shadow of a person was shown on a canvas and the outline painted in, they were inexpensive to have made. Beyond a painted version, others trained in making silhouettes could cut out the profile of a person using black paper and then glue the black shape onto white paper. These artisans could look at a person and from the shape of their face, they could cut a silhouette without tracing it first. Tape a piece of white construction paper onto a wall. Have the person sit sideways in front of the paper; have someone use the light to cast a shadow of the profile on the paper. Trace the profile onto the black paper and cut it out. Glue the profile onto the other white paper. To make a shadow picture of your friends and family, attach a black piece of construction paper to a hard surface like a door or a wall. Have your subject (the person) sit in a chair in front of the paper and place a light on the other side of the person so that the subject’s shadow will appear on the paper. Trace the shadow of the person on the paper with a piece of white chalk. Remove the paper from the wall and carefully cut along the chalk line. Attach the cut out to a piece of white paper. (Glue the chalk-line side down, so if you made any stray marks they won’t appear on the finished side.) You now have a finished silhouette! You can also use a pencil to trace the shadow on a white piece of paper. After tracing, color in the outline with a black crayon or marker. Colonial daily life, school, food, and clothing. Be sure to check out both pages. The combined data is not only informative but will help you make the most of this theme! The image to the left is the Noah Webster House, built about 1748. It is the restored birthplace and childhood home of the great lexicographer, Noah Webster. The house was once part of a 120-acre farm. Colonial America generally refers to that period of history prior to the American Revolution dating back to the establishment of North American settlements controlled by various European powers including France, Spain, the Netherlands, and in particular, Great Britain. It commenced in 1607, and ended with the onset of the American Revolution and the subsequent founding of an independent United States of America. THE FIRST PERMANENT SETTLEMENT in North America was the British colony at Jamestown, in 1607, in what is now the State of Virginia. Although of questionable success, Jamestown set the stage for other chartered incursions into the New World, including the Pilgrims of Mayflower fame who, seeking refuge from religious persecution, soon followed in 1620, settling near Plymouth Rock in coastal Massachusetts. In rapid succession, prosperous British colonies sprang up along the Atlantic coast, from Maine in the north, to Georgia in the south. Swedish and Dutch colonies also took shape in and around New Amsterdam in what is now New York State, while France and Spain continued to slowly expand their vast territories to the north, south, and west. As more and more people arrived in the New World, territorial disputes invariably arose between the competing European powers, as well as with the several Native American tribes whose homelands the Europeans had co-opted as their own. Colonial America history was characterized by continuous expansion, hardship and privation, prosperity, and internecine warfare. By the end of this period, the two continental powers with the largest holdings in eastern North America were Great Britain and France. These two nations fought for control of eastern North America in what is known as the French and Indian War (1754-1763). The British won the war and gained control of the valuable French settlements in Canada, as well as retaining control of their own highly productive colonies which stretched southward from Canada along the eastern seacoast. Those thirteen colonies included Massachusetts, New Hampshire, Connecticut, Rhode Island, New York, New Jersey, Pennsylvania, Maryland, Delaware, Virginia, North Carolina, South Carolina, and Georgia, and would soon band together in a war of independence from Great Britain. 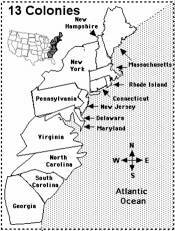 The thirteen semi-autonomous colonies can be grouped into three general regions: New England, the Middle Colonies, and the Southern Colonies. Life within each region tended to evolve from the opportunities the land itself presented. consisted largely of farming and fishing communities. Dietary staples such as corn and wheat grew in abundance, and much of it was shipped abroad. Because of its proximity to the Atlantic Ocean and the abundance of natural harbors and interior waterways, New England evolved into the hub of transport and commerce between colonial America and Europe, and Boston became its predominant port. were partly agrarian and, partly industrial. Wheat, barley, and other long grains flourished on rolling farmlands of Pennsylvania and New York. Foundries in Maryland produced pig-iron, while factories in Pennsylvania produced paper and textiles. Raw materials and bulk products were shipped overseas and commercial trade was plentiful. were almost entirely devoted to large scale labor-intensive agricultural production, whose characteristic feature became the development of plantations, large privately-owned plots of land comprised of farmlands dedicated almost exclusively to cash crops in high demand, including tobacco, rice, indigo, and cotton. Plantations served as agricultural factories whose production demands induced landlords to maximize profitability in high-risk ventures. Thus, the tragic trade in human slavery — long a staple of the British Empire — was introduced in 1639, expanding rapidly throughout the south alongside the geometric rise of the wealthy land barons, whose power and influence would extend across the greater part of the next two centuries. Many colonial New Englanders believed that religion — and in particular, Christianity in its various manifestations — should be an integral part of every child’s education. To that end, parents taught their children to read the Bible, and to endeavor to adhere to their interpretations of its teachings. However, New England villages established the first public grammar schools in which young men were taught Latin, mathematics, language composition, and other subjects needed to further their education toward a profession, or to secure a useful trade. The emphasis was largely upon self-reliance, pragmatism, industry, and the adherence to Christian theology. Higher education was private and reserved for the wealthy few who could afford to send their young men abroad to study. By contrast, although many young women learned to read, initially they were not allowed to attend grammar schools, but were instead encouraged toward obedience, chastity, and domesticity. SIMPLE ONE ROOM SCHOOL HOUSES were the norm for most grammar schools which were often located in small villages, or at key crossroads in the surrounding countryside. Heating came from large fireplaces, and later, cast iron stoves. TEACHERS often had few tools and little formal training. Because teachers were not well trained, students spent most of their time reciting and memorizing lessons. All grades were taught in one room, at one time, by one teacher, sometimes with as many as seventy students in a single classroom. Primers were generally shared among students. Chalk and practice slates were also shared. Students wrote with quill pens in copybooks that were sometimes fashioned at home. The first schoolhouses did not have desks or chairs. Rather, students sat on chairs or backless benches, or in their absence, on the floor. Smaller, younger students sat in the front, while older, taller students sat further back. Connecticut established the first six-month school year. Boys generally attended school only during the winter months when there were fewer farm chores for them to do, while girls and younger children attended school during the summer. Students ranged in age from four to twenty years. Additionally, as children were still considered to be essential contributors to their family’s economic welfare, if their parents needed them to work at home, they did not attend school, and most were required to do daily chores before and after the school day. The center of family activity colonial homes was the kitchen. With its large fireplace and hearth, it was the busiest and warmest room in the house. Most cooking utensils were made of cast iron. Large kettles could be very heavy. Skillets were sometimes equipped with legs so they could be placed directly over the fire. Some colonial kitchens had wood-fired ovens. To place baked goods in the oven a long flat shovel called a ‘peel’ was used. This is a typical fireplace from the colonial settlement at Jamestown. What you’re seeing in this picture is half of the entire cottage/house. The earliest fireplaces were simply places where you set the fire. There might be an opening in the wall or roof to let out the smoke. Later a smoke hood would be added to channel the smoke up and away from the room, and eventually the fire place evolved into what we think of now as a fireplace. Women often began cooking the daily meals before dawn as they could take hours to prepare. They built wood fires in the fireplace, carried water indoors using wooden buckets, picked vegetables from their gardens, milked cows, gathered eggs, or hung and salted fresh meat to cure. Large breakfasts were served only after the other family members had completed their morning chores. Generally speaking, the day’s main meal was served at mid-afternoon. When not attending to faming duties, men trapped, fished, and hunted wild game. Meat was generally boiled, seared over an open flame, or simmered in stews. Colonial families also owned domesticated animals to provide their households with milk and eggs, and grew their own fruits, vegetables, and grains. They also learned how to use herbs such as thyme, sage, marjoram, and dill that grew in the surrounding wilds. Natural fruits and berries were also harvested during their appropriate seasons. Waste was considered a sin. American colonists got their food from several places. People who lived on the Atlantic coast often caught fished and hunted whales. They sold fish and whale blubber at fish markets, which were usually down by the docks. Eventually, whale hunting became a major industry along the east coast. Gigantic sperm whales were particularly prized for their reserves of natural oils which were used lubricants in developing industries. Prior to the development of refined petroleum in the 19th century, whale oil was burned in lamps worldwide because of its ability to produce clean, bright, white light. Unlike the Southern Colonies where the climate and terrain favored the development of large plantations dedicated to the production of a single cash crop, New England colonists and farmers from the Middle Colonies grew a variety of crops on smaller parcels of land, Wheat, barley, corn, rice, and tobacco grew in abundance and provided a basis for barter and trade between the Colonies and Europe. The preponderance of navigable inland waterways facilitated this trade. Colonists loved sweets and desserts. Pies, cobblers, and cakes were commonly served at the end of a meal. Apple Tansey was a favorite. This sugary dessert was made from apples covered with a sauce made of beaten eggs, cream, nutmeg, and sugar. Maple syrup was used to sweeten foods, especially popped corn. Various teas were made from native roots and leaves. Cider was made from peaches or apples and fomented into a popular alcoholic beverage. The colonists also drank locally distilled beers and ales. Winter famine was greatly feared, and unfortunately, was all too common, especially if one was unprepared for the long, harsh winters typical from the mid-Atlantic region upward into Canada. Therefore, it was very important that food stocks be prepared to last through the winter months. Meats were pickled, salted, or slow smoked for storage. Apples, peaches, and pumpkins were peeled, sliced and hung to dry. Canning in tins or glass jars, or pickling in brine-filled wooden casks, were common methods for long term food storage. Roots, tubers, potatoes, and other staples were stored in underground cellars, far below the killing frost line. Colonists made much of their own clothing, using wool, linen, and tanned animal hides. The colonists grew flax to make linen thread, and raised sheep for wool production. Clothing was generally limited to two sets, one for every day, and one for Sunday. Every person in the family worked on clothing. Children would gather berries and roots to make dyes to color the thread. Colonists liked brightly colored clothing. Yellow, red, purple, and blue were their favorite colors. Thread was sometimes dyed with poke berries and used to make brilliant red capes for woman and girls. Women and young girls spun woolen thread at foot-peddled spinning wheels. Girls were encouraged to learn how to knit stockings, caps, and warm winter gear. Boys and men also produced hand-woven fabrics on household looms from which woman and girls would sew clothing for an entire family. CLOTHING AND THE WORD ‘UNDRESS’… ‘Undress’ in the 18th century referred to the everyday, utilitarian working clothes. Much of the following clothing is of for ‘undress’ and not more formal. MEN wore long stockings and knee-length pants called breeches, linen blouses, and long buttoned waistcoats similar to today’s vests, and topped by a long woolen coat, split at its back to accommodate riding. They sometime wore WIGS made of human hair, goat hair, or horse hair. Wigs were made to fit tightly on the head and prized for the quality of their materials as well as their size. One’s social status might be determined upon the basis of whether one were a wealthy “big wig” — a term that endures even today– or considered to be poor — due to the condition of one’s wig made of ordinary powdered thread. UP TO THE AGE OF FIVE, YOUNG BOYS were often dressed identically to young girls in loose-fitting gowns. After the age of five, boys were dressed in attire similar to their father’s. A philosophical movement toward less restrictive dress for children occurred during the second half of the eighteenth century. At the same age, YOUNG GIRLS were previously encouraged to dress more like grown women. Around the mid-eighteenth century, the concept of dressing children to resemble “little adults” began to give way to clothing designed specifically for their needs. By 1760, for dress wear, instead of wearing the tight dresses styled similar to those of grown women, little girls and boys who were not yet breeched were attired in more comfortable white cotton or linen frocks that had drawstrings tied at the back, low necklines, and often were decorated with wide, colorful sashes around the waist. A mob cap was undress (casual) headwear; becoming popular in the 1730s and worn in some form into the next century. It had a puffed crown placed high on the back of the head, a deep flat border surrounding the face, and side pieces carried down like short lappets, which could be left loose, pinned, or tied under the chin. The flat border usually was frilled or had lace. In order to enhance their feminine curves, wealthy women sometimes wore corsets into which were sewn whalebone stays. These stiffened undergarments were then tightly laced to draw in the waistline. Working-class women did not wear these undergarments because they made everyday labors impossible. BABIES of both genders sometimes wore a small soft pillow tied with ribbon around their middle to keep prevent injuries from falls. These pillows were referred to as ‘pudding’. The shoe image is of dress shoes-not for utalitarian undress. Shoes were made of silk fabrics, worsteds, or leathers. Depending on currentfashions, they may or may not have had elevated heels. They would fasten by buckles, clasps or, if very utilitarian they might have ties. The everyday footwear was made to fit either foot; there was no right or left, and the shoes offered little or no support. ARE YOU HAVING A COLONIAL THEME IN YOUR SCHOOL, CLASSROOM OR AFTER SCHOOL PROGRAM? Have children come in Colonial Attire…the image to the right is made with clothing that children of this century put together on their own. All costumes can be made inexpensively from clothing you have at home. Below are some guidelines for your basic costume. If you choose to dress as a trades person, you can add additional garments such as aprons, scarves, or hats. White soccer socks should meet the cuff of the breeches. A vest was also commonly worn over the shirt. Boys should also wear shoes and not sneakers to complete their costumes. Girls should wear a long skirt and blouse or a dress that is made from plain or simply printed fabric. Girls can also wear aprons and a white mob cap depending on their trade. Girls should also wear shoes and not sneakers to complete their costume. Although American colonists had parks in their communities, they were not like today’s parks where children frolic on manicured playgrounds. Rather, they were similar to the smaller plazas around which many European cities developed. In colonial America, these centralized parks were referred to as ‘the commons’, because they were held in common by the members of the local community. Unlike their cobble-stoned European counterpart, the common areas of colonial America were comprised of large grassy knolls, often containing a source of natural water. Cattle often grazed in the common. The common also contained the village meetinghouse, or town hall. Commons were especially popular in the New England colonies. In fact, Boston, Massachusetts still has its original old common at the heart of its modern metropolis.